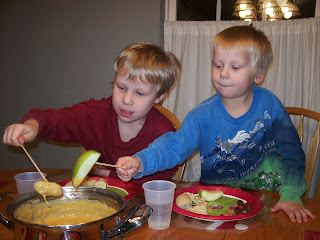 Mudpies to Dragonflies: Nothin' Says Celebratin' Like Fondue! 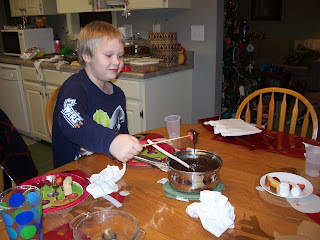 Nothin' Says Celebratin' Like Fondue! I know New Year's is gone in many of your memories as the stores rush to sell you pink and red valentine's, but I just wanted to post a few pics and a few recipes. 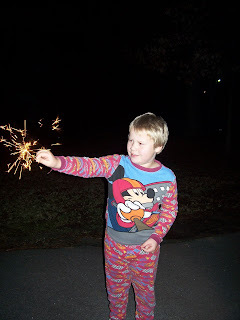 So let's take a little wander back to my New Year's Eve Celebration! 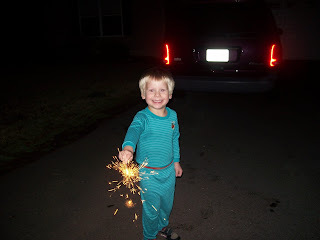 Our family chose to celebrate the arrival of the New Year with plenty of home grown fan fare and pajamas. 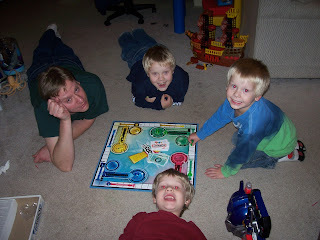 Game boards and electronic games were the entertainment while the dinner was coming together in the kitchen. Dinner was mini sausages, bread chunks and apples dunked in cheese fondue. Chocolate dessert fondue followed our cheese fondue. What could be tastier than fruit, marshmallows and pound cake dripping in chocolate? Just before midnight we poured "toasting beverages" (champagne for the grown ups and Sprite for the kiddos) and turned on the tv so we could watch the ball drop. 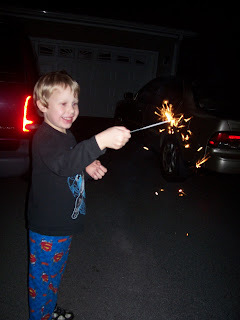 We counted down and then kissed and toasted and ran into the driveway to light sparklers. Mix the spices and flour. Add a small amount of the apple juice to the flour/spice mixture in a seal able jar. Shake until smooth. Pour in a saucepan and whisk in the rest of the apple juice. Stir in the cheese. Let simmer a bit and then dip away! Warmed (mini) sausages, hunks of bread, and green apple slices were very good dipped in the cheese fondue. In heavy saucepan, over medium heat, melt chocolate chips and butter with sweetened, condensed milk, and water. Cook and stir constantly until thickened, about 5 minutes. Remove from the heat and add vanilla. 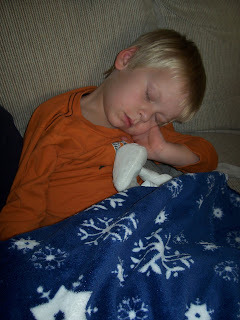 May God grant you His many blessings in 2008! Fun! I can't believe how much those boys look alike! 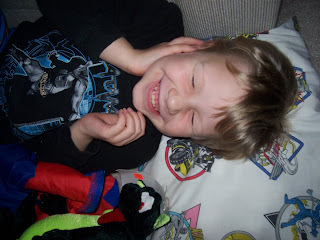 Thank you for popping by my blog! I'll add you to my blogroll so I can read more of your blog when I have time. P.S. I love fondue. Haven't had it in a long time because I've lost touch with my college friends who I did most of my fondue-ing with, and usually it is just me and my husband around at New Years and it seems like too much work sometimes to do fondue. BTW, I never heard of cinnamon in the cheese fondue recipe! might have to try that sometime. Hope you'll pop by again! That sounds like a great way to start the new year - what a party! I just cannot thank you enough for all of the wonderful ideas that you gave me for our WM's & for the websites. I will definitely be using some of them! It sounds like you have an awesome Women's Ministry. I am very hopeful that ours will be all that it needs to be. I love Beth Moore also. Thanks again. I love your blog! What a fun New Years! What a fun night. Your meal looks so yummy. Kids love to dip. I will have to keep fondue in mind for the future! 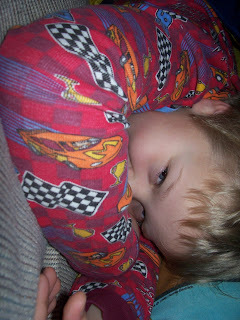 Looks like is was so much fun! Fondue----yummy. 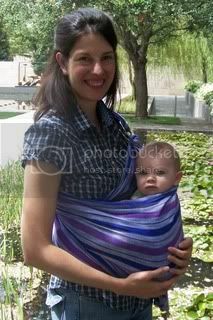 Love that last photo---so cute. Thanks so much for visiting my blog today! I agree it makes it so handy having a notebook handy. Blessings! I stumbled upon your blog this morning and am stealing your cheese fondue recipe....oh so yummy sounding...thanks for sharing! How to Enjoy South Carolina Snow! 2, 4, 6, 38 Who Do We Appreciate?